Anyone who frequents Lowe’s Home Improvement has no doubt seen their in-house Kobalt tool line and probably wondered if it’s any good. 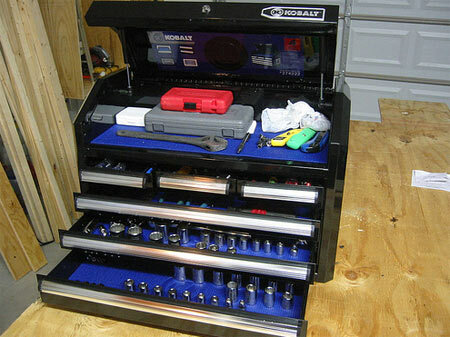 A recent search for a larger tool chest led me to the lower half of their 41” roll cabinet in stainless steel. 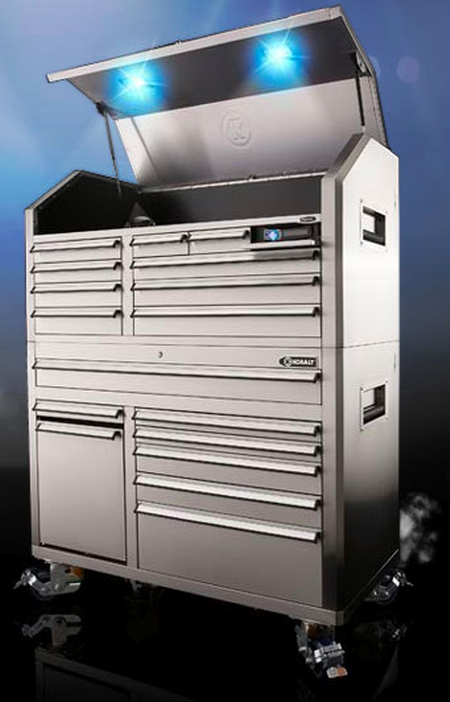 It’s a good-sized unit with solid construction — nothing like a fully-welded Snap-On behemoth, but with a quality easily better than mid-range Craftsman units, and at a very good price. The steel is the same middling grade of stainless you’d find on a cheap barbecue, but while some may store their barbecues outside, no one in their right mind would leave a toolbox out in the rain. After a few month’s use, I’ve been very happy with the unit. The wide top drawer is sensitive to uneven loading and sometimes binds on the way out, but the ball-bearing hinges are very smooth, if a little wobbly. The tall lower-right drawer is a perfect solution for tall bottles of shop chemicals, and foam-lined drawers ensure a harmless environment for your collection. For a shade over six hundred dollars, it’s hard to do better. 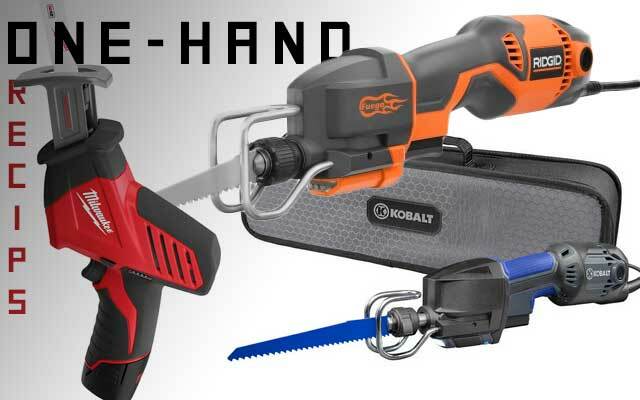 Lowe’s has marked down this Kobalt bow/hack saw combo to $10 in preparation for Father’s Day. The saw frame’ll take any of Kobalt’s 12″ bow saw or hack saw blades, and with the built-in tension system you can adjust the blade to just the right sturdiness for whatever you’re cutting. The larger opening allows you to cut big items, making this very handy for projects around the house. These sockets work where deep sockets just aren’t deep enough. 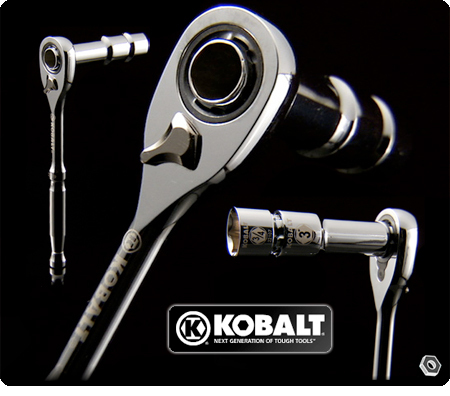 Kobalt’s Thru-Ratchet sockets and ratchets are hollow down the center, so they can fit over any length of bolt. In a lot of cases you could get the same performance out of your ratcheting wrenches, but this system allows you to get into deep recesses that would otherwise be inaccessible. 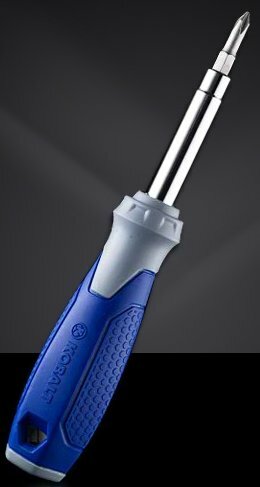 Thru-Ratchet sockets plug right in to the ratchet handle, instead of attaching to a square drive. Integrating into the handle reduces overall height by up to fifty percent over a standard ratchet and socket — which is good for areas with low clearance. 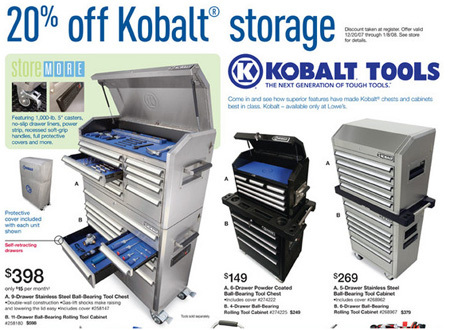 As part of their end-of-the-year sale, Lowe’s is slashing 20% off the price on all Kobalt tool chests. 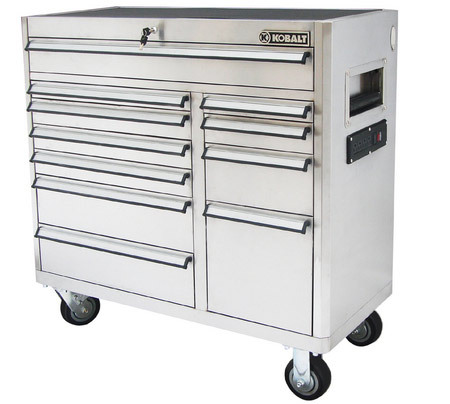 With gas-spring supported lids, sturdy ball bearing slides, spacious load-bearing drawers, and a sharp finish, these chests store your tools in style. As a bonus, each well-constructed unit includes no-slip drawer liners and a dust cover. Strap This On Your Power Drill And Kobalt Will Make Your Whole Life Better. Or Not. Most cordless drills come with on-tool storage for one or two bits, but sometimes one or two bits just isn’t enough. 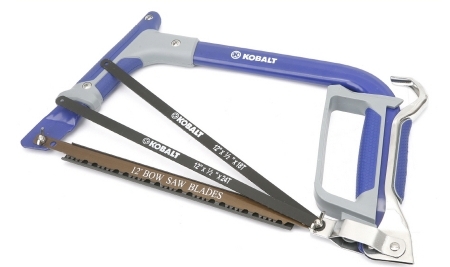 That’s why Kobalt created a weird-looking bit strap: to keep you working instead of climbing. Of course, unless this bit strap gets you coffee or cleans up after you, we suspect it won’t “change the way your work.” Read on past the jump for a massive picture, plus lots more information.